So right before the election, DJ Z-trip and Shepard Fairey put on some fundraisers for the Obama campaign called the ‘Party For Change.’ Z-Trip released a get-out-the-vote mix right in conjunction with those parties right before the election, and it was top notch. Z-Trip as usual showed he is a master of the craft when it comes to blends and inventive mixing. He just followed it up with a new Obama Mix, called ‘Victory Lap.’ Cop it and enjoy! And as long as you’re at the z-trip download page, you should probably cop “Uneasy Listening” and the “Motown Breakdown” while you’re at it. Wow. Iceland’s government has collapsed. Double-Wow. Bush and co didn’t even keep case files on Guantanomo detainees. Un-freakin-believable. I like that Obama repped Hawaii during the inauguration. Coolest. President. Ever. Someecards puts it nicely here. But I am a tad concerned. I hope America realizes that the man won’t be able to make it shower rainbows and puppydogs overnight in this piece. This fascinating wordcloud analysis of Obama’s speech vs. past presidents is an amazing way to look at speeches. 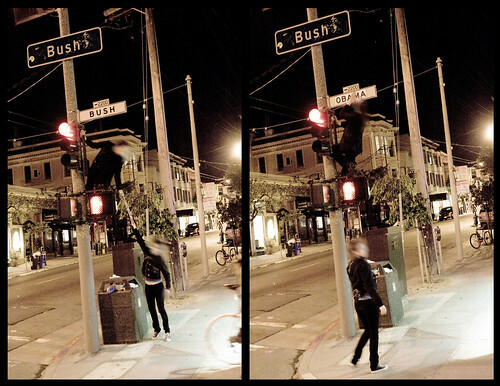 There sure was a lot of coverage of Michelle Obama’s dress, but not much coverage of the effing awesome guerrilla street sign jedi move pulled in San Francisco of Bush street getting changed to Obama street. Big ups to laughingsquid and takingcareofbidness for that one. And can I get a hell yeah for Obama shutting down Guantanamo?